A native of Atlanta, Ashley Francis coupled her love for fitness with an appetite for entrepreneurship to open the first boutique indoor cycling and strength studio in Sandy Springs. Her self-motivated drive to succeed in both sports and business have culminated in her latest venture, TURN Indoor Cycling + Strength Following graduation from Clemson University, a burgeoning career in medical sales led Francis to San Diego where she spent years honing her business expertise and learning the value of customer relationships while promoting a healthy lifestyle. In 2017, drawing upon her business prowess and enthusiasm for wellness, she took a leap of faith and returned to Atlanta to build a place with everything she craved: intensity, inspiration, and a community of hard working hustlers getting an empowering workout. That place is TURN Studio. 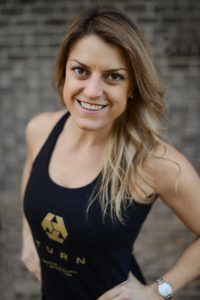 Francis is a powerhouse of positivity and hopes to build positive change in the lives of her clients through inclusive motivation, engaging fitness classes and active charitable involvement within the Sandy Springs community. She is certified through Stages Cycling and an international presenter and trainer. A respected leader in the boutique fitness industry, Francis is a living, breathing example of taking your passions seriously without taking yourself too seriously.